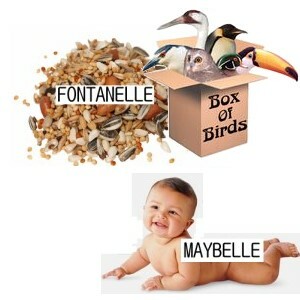 When Fontanelle discovered that there was a brand of bird seed using her very name as a brand name, she quickly changed (she was fifteen years old and her mother said she could) her name to Maybelle, totally oblivious to the fact that Maybelle was a brand of baby wipes. Couple that with the fact that her family name was Bogjiss, which no one knew how to pronounce, and that school acquaintances called her Boggy for short. Fontanelle retreated into her shell considerably. Now that she’s older and married, she doesn’t give a stuff. In fact, when she married she convinced her husband to be the one to change his surname to Bogjiss. These days, Maybelle and Mjassischtschew Bogjiss are as happy as a box of birds.